Canada is known for many things besides hockey, Tim Horton's and Rush. Canada is a country which possesses a wealth of unequalled natural beauty, a diverse range of landscapes and ecosystems ranging from the majestic sweep of the Canadian Rockies to British Columbia's lush pacific rainforests, the modern cityscapes of Toronto, Edmonton and Vancouver to the old world charm of Quebec and the Maritime Provinces. Canada also offers the untamed tundra and taiga of Yukon Territory to Manitoba's Hudson Bay shores, the unspoiled boreal forests of the Northwest Territories to the prairies of Alberta and Saskatchewan and the ethereal beauty of Nunavut Territory's Arctic Archipelago. Still not sold on a Canada tour? Let's talk bears – grizzly bears, black bears and polar bears! If you're interested in seeing Canada's largest predators, Canada Polar Bears can take you to where the grizzlies and polar bears are on a single unforgettable wildlife tour of Canada. 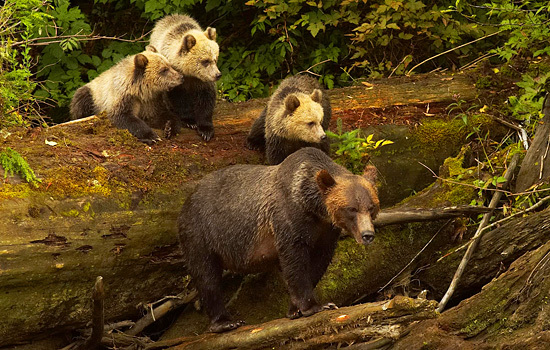 The unique Pacific rainforest ecosystem of British Columbia is home to many grizzly bears and black bears. Located within easy reach of cosmopolitan Vancouver, BC, the rainforest is exactly where you want to be when the salmon run gets underway and bears flock to the riverside to feast on wild salmon. It's a Canada wildlife tour which offers two natural wonders in one – and you haven't even seen the polar bears yet! The sight of salmon swarming against the current is a mystery of nature; and being able to see grizzly bears at relatively close range is a one of a kind experience you'll never forget. While you're in British Columbia on your Canada bear tour, take a day to admire the scenery and the marine wildlife of the province. Orca whales, humpback whales and minka whales are all frequent visitors to Johnson Strait, BC and you'll also see bald eagles, seals, dolphins and other Pacific Canadian wildlife. After a night's rest and recreation in Vancouver, it's time to see the polar bears; you'll take a flight to Winnipeg, Manitoba. This city on the Canadian prairie has many sightseeing, dining, shopping and entertainment options to explore, but don't stay too long; Canada's polar bears are expecting you! Your next stop on your Canada polar bear vacation is Churchill, MB, known as the "Polar Bear Capital of the World". You can travel from Winnipeg, MB to Churchill, Manitoba by air or by rail. A trip to Churchill, MB by rail is a relaxing one which allows you to rest up and watch the landscape changing from prairie to woodlands to tundra – but if you're in a hurry, you can catch a flight and arrive in Churchill in no time. Churchill, Manitoba is located on the southern shores of the Hudson Bay, where over a thousand polar bears arrive each year in late October where they rest, play and wait for the Bay to freeze so they can continue their annual migration. It's unlike anything you've ever experienced; only in Churchill, MB can you see polar bears in these numbers all in one place. You'll probably want to jump in the nearest tundra buggy and start your polar bear watching the second you arrive; but there are a few things you should see and do in Churchill, MB including an Inuit art museum, the natural history exhibits of the Parks Canada Centre and if the snows have started to arrive, a ride on a dog sled is not to be missed. Don't forget to look up either! Manitoba's Hudson Bay region is home to many species of waterfowl and other birds and on a clear night, you'll be able to see the Northern Lights! It's just the right finishing touch on a perfect Canadian vacation. A few days of marveling at the polar bears as they prepare for the long migration ahead and visiting the cultural and historical attractions that Churchill has to offer and you'll have to bid a fond farewell to Churchill and its polar bears and return to Winnipeg, MB for a final night's stay before you head home. Whether you'd like to book your first cross country Canadian polar bear and grizzly watching vacation or you've gone before and can't wait to go back to see the bears, the landscapes and the amazing wildlife of Canada again, Canada Polar Bears can give you the perfect Canadian wildlife adventure. From Vancouver, BC to Churchill, MB it's a holiday in Canada like no other. Need more information on Bears In Canada? Talk to one of our Canadian travel Insiders who'd be happy to answer all your questions.